Ian A. G. Shepherd, Monica K. Greig. 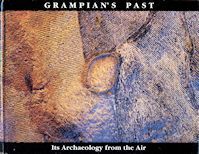 Grampian's Past: its archaeology from the air. This book is a collection of vivid aerial photographs which tell the story of Grampian's past. These photographs were taken for the archaeological Sites & Monuments Record of Grampian Regional Council over the last 20 years. The publication of such compelling images of past landscapes at the time of changes in local government marks the contribution made by the Regional Council to the understanding of the archaeology of the region.